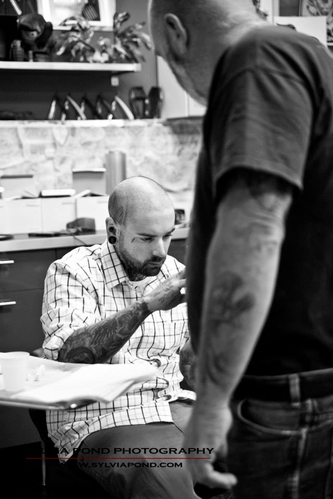 Each Perfect Image location houses an impressive roster of tattoo artists, each with their own style and approach. With this kind of versatility it is certain you will find an artist that will be able to work with you to bring your tattoo ideas to fruition. If you are unsure or you don't know exactly who would be best suited, our staff will be able to direct you to the right artist. You may be asked to provide valid photo ID. You must be 18 years of age to sign for your tattoo without parental consent. If you are underage you will be required to have a parent present with valid photo ID for both you and your parent. That being said, we have the right to refuse service even with parental consent. This is strictly on an individual basis and is always determined with your well being in mind as well as the artists. Every artist at Perfect Image takes great pride in their work. Your tattoo is also their art and no artist wants their name associated with a tattoo that, while it may sound like a good idea, may not translate well into a tattoo. Your artist will give you instruction on taking care of your tattoo for the best possible heal using the aftercare package available for purchase in store. If you choose not to purchase the aftercare package they will give you alternate suggestions. Listen to your artist and follow their instructions, they truly know what's best. Throughout history, tattoos have served many purposes - rites of passage, marks of status, symbols of religious and spiritual devotion, decoration for bravery, marks of fertility, even punishment and slave markings. However, in the last couple of decades, we have seen tattooing (along with body piercing) experience a resurgence in popularity and develop into a much more widespread practice, becoming increasingly fashionable. Today, tattooing still retains its historical heritage, but it is an art form more widely used for cosmetic or decorative reasons. This is directly related to the advancements in tattoo pigments and equipment and its introduction into pop culture which have helped tattooing become a much more celebrated art form in today's society. Before getting tattooed you will be required to fill out a consent from. This is for legal purposes and informs us of any medical concerns that could impact the healing of your tattoo. (See Tattoo Health Risks) Proof of age may also be requested. Persons under the age of 18 must have parental consent which will require a signature from a parent or legal guardian. Please note that, with or without parental consent, the artist has the right to refuse work if they are not comfortable with it for any reason. Your artist will discuss the procedure and design with you. When all paperwork and design details are finalized you will be prepped in a private room. This will include cleaning the area to be tattooed and in most cases, a stencil is applied to be sure the placement is what you are looking for. The most common method of tattooing is done with an electric machine that operates on an oscillating unit. Attached are a series of needles that are secured to the unit which will deposit ink by piercing the skin repeatedly and rapidly. Once completed, the tattoo will be cleaned and bandaged and aftercare instructions will be given. In some cases tattoos will be completed in multiple sittings, this usually is done for larger pieces like sleeves. In this scenario, the tattoo from the first sitting must be full healed before a second sitting can take place. Each Perfect Image location is in compliance with it's regional heath unit. Your tattoo artist has been thoroughly trained to take all necessary precautions to protect you as well as themselves. Sterile single-use gloves are worn by the tattoo artist. During each tattoo session, your tattoo artist will open a new package of sterile needles in front of you that they will use. Any other disposable instruments or supplies that will be used during the session will be both new and sterile, again being opened in front of you before use. Each session will use fresh ink poured into disposable containers which are discarded after each client. Also, all areas which may be touched with contaminated gloves will be wrapped in clear plastic to prevent cross-contamination. Equipment that cannot be autoclaved (such as counter tops, machines, and furniture) will be wiped with a hospital-strength germicidal disinfectant. Before any tattooing begins, we also ensure that the area on your body where the tattoo will be applied is shaved (if necessary) using a disposable one-time use razor and then disinfected. Each studio is equipped with bio hazard containers for objects that have come into contact with blood or bodily fluids and sharps containers for used needles. All Perfect Image studios take every precaution to reduce procedural risks. (See Sanitation) There are some risks associated with existing heath conditions that may cause allergic reactions or infection. These can be minimized by taking proper care of your tattoo exactly as directed by your tattoo artist. In rare cases, allergic reaction to certain pigments can occur. Persons who are sensitive or allergic to certain types of metal may experience swelling, redness, or itching. In some rare cases persons who are sensitive or allergic to some metals may experience reactions to certain colours of inks, primarily red, yellow, and occasionally white. Some may experience bruising around the tattoo. This is common and normal and heals usually within a week. It is recommended that persons with diabetes, hemophilia, auto-immune disorder, persons taking blood thinning medications or persons with other medical or skin conditions that may hinder the healing process should consult your doctor before getting tattooed. Recipients of organ or bone marrow transplants should also consult a doctor to ensure a proper prescribed regimen of antibiotics is administered prior to getting tattooed. It is also advised that you inform your tattoo artist of any metal allergies or allergies to certain healing agents that could be found in aftercare. Women who are pregnant or nursing will be refused so as to allow the appropriate attention the body requires for the demanding and complex task it is already performing.